The lead article on the October 8 front page of our Nevada County newspaper, The Union, featured this vineyard and its affable owners. 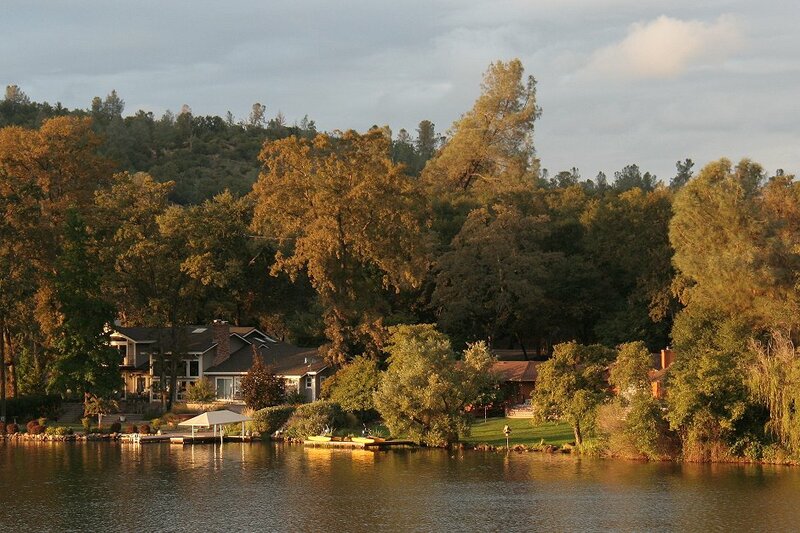 So, a 40-mile round trip on the back roads to the winery became our weekend drive in the Sierra Foothills. We took Pleasant Valley Road to Birchille Road, to Hwy 49 where Birchville Road becomes Tyler Foote Road, to Purdon Road (Mother Truckers is on the corner), right onto 1.6 miles of wiggly Purdon Road to the winery, on the left. This is by far the best route from Lake Wildwood if you don't mind wiggling down to South Yuba River State Park and back up toward Birchville road on the other side of the river. The entire route is wiggly, which is part of the fun on a leisurely drive. Autumn view from our dinner table the evening before our trip. It must be harvest time! 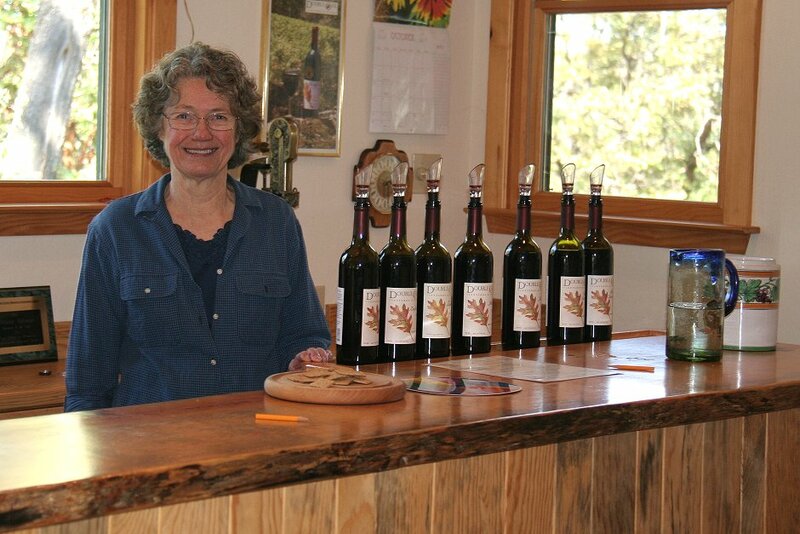 Bob and Ginny Hilsman have been growing grapes on their ten acres for the past 30 years. They opened their winery in 1997. Before we left home I called Bob to make sure they were open. He was just on his way out to door to a wine event in Auburn. Ginny was there to greet us, and other visitors, when we arrived for tasting. I asked Ginny to pose in front of their many awards from several counties and state competitions. The awards range from bronze (a few) to silver, gold, and best of class in the state. 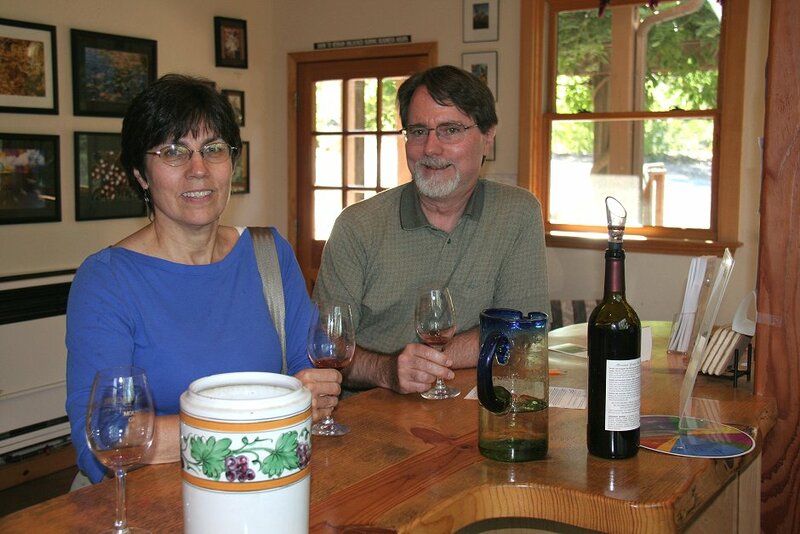 We met these wine lovers visiting from Maryland. Nancy Cavallaro is a program leader at USDA and David Dayton is in the GAO (Government Accountability Office), a federal agency that works for the Congress to identify $billions of waste in agencies of the executive branch. Instead of being rewarded for identifying many billions of waste, GAO is facing a hefty budget cut that could mean hundreds of layoffs (to which David says, raising a glass of wine, "Don't worry. Be happy."). Kill the messenger? Mmmm? After tasting about eight wines we bought eight bottles of three varieties. 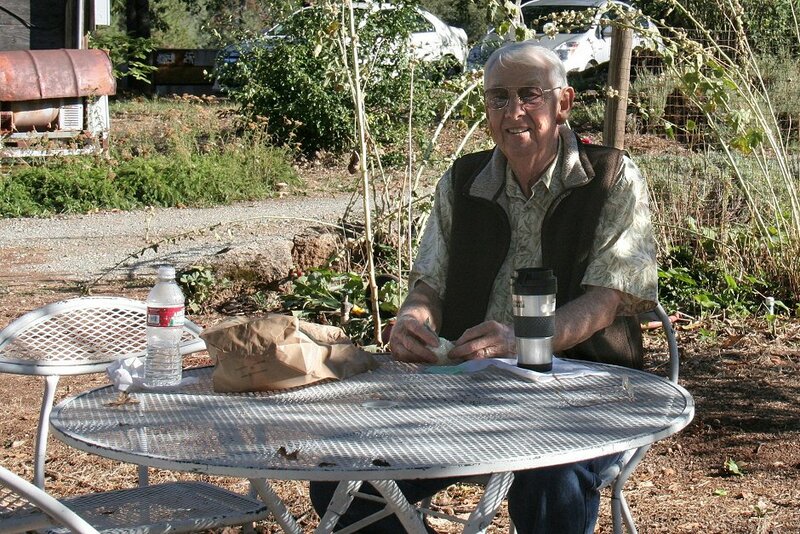 Then, near the tasting room, we had a picnic lunch- supper of a chicken wrap and a peach (Mary didn't want one) we bought at Mother Truckers on the way to the winery. The store is on the corner of Tyler Foote Crossing Road and Purdon Road. The winery is about 1.6 miles south on wiggly Purdon Road. On our way out the gate to the winery (which keeps out vine-eating animals) I walked in to inspect the vines. The grapes were sweet and nearly ready for harvest. The evening sun made for a nice picture. 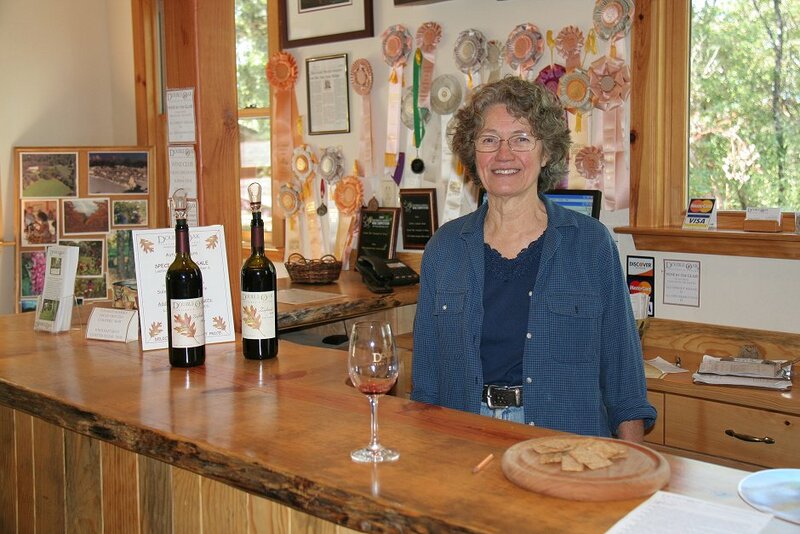 A month later the winery had an open house, announced by this email invitation from Ginny. Be on the lookout for similar events in the future. Ginny would be happy to put you on her distribution list if you're not already on it. Celebrating 26 Harvests & 15 Vintages! Help Us Celebrate Our 26th Harvest & 15th Vintage! 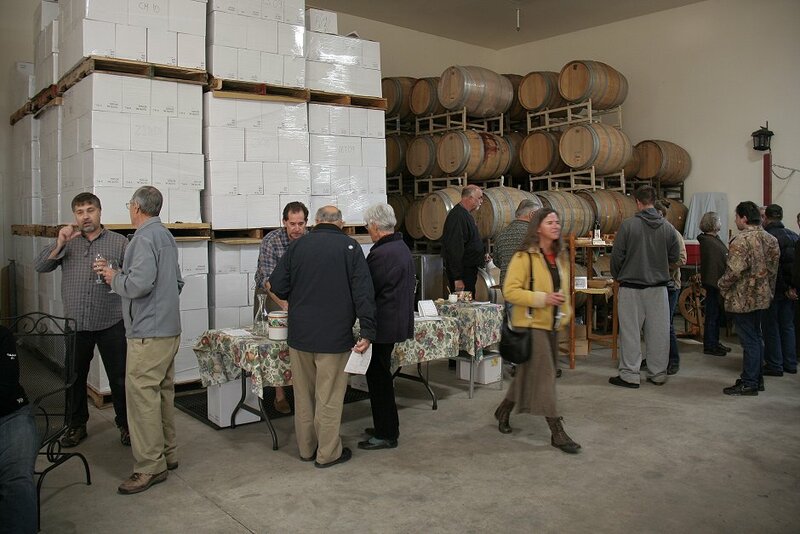 ~ Enjoy tasting delicious Double Oak fine wines paired with savory gourmet hors d’oeuvres. ~ Delight in fine arts and crafts while meeting the artists and artisans. 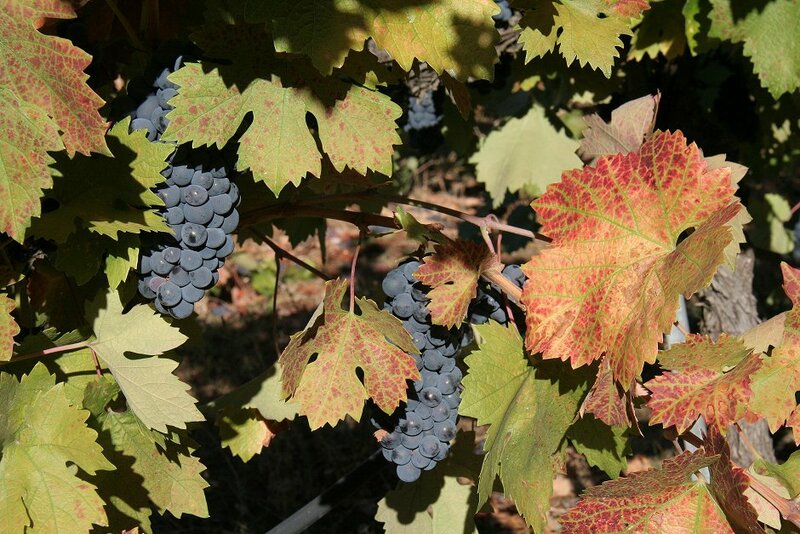 ~ Tour the winery and vineyard with the winemaker Bob Hilsman. ~ Take pleasure in entertaining music. ~ Find unique gifts for your friends and family. ~ Take advantage of special Double Oak wine sale. ~ Stock up on Double Oak wine to share with your friends and family during the coming holiday season. The price of admission to this Harvest Open House is $5. Admission includes a free logo wine glass. There were huge stacks of cased wine along with wine aging in barrels. 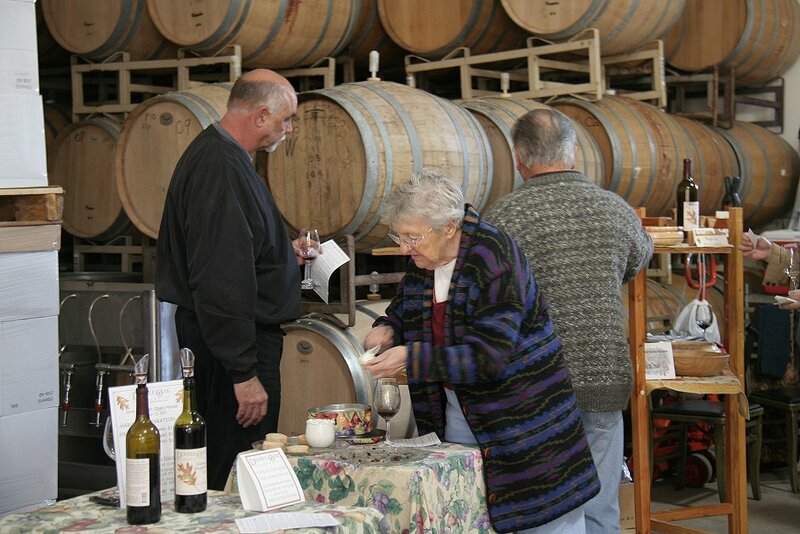 Art and craft vendors had supplied goodies to eat between wine tastings. Mary samples some here. 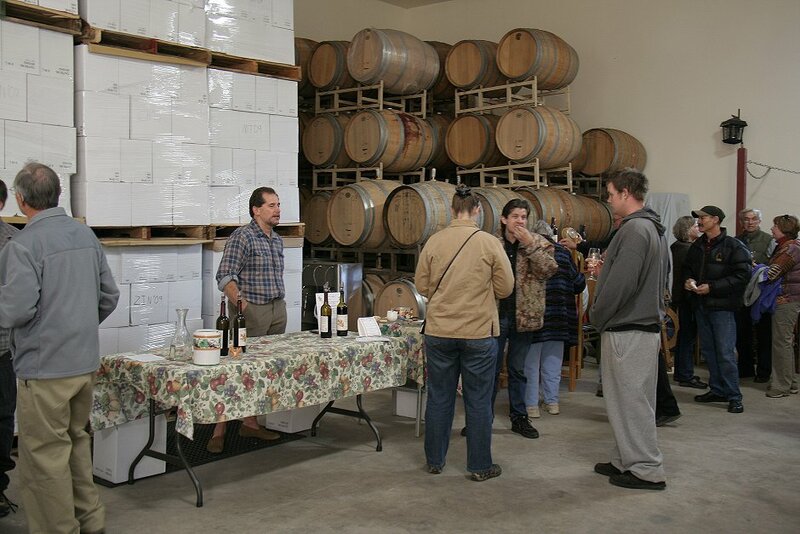 Wine samples were served from three tables, two here in the store room and one outside with the vendors. 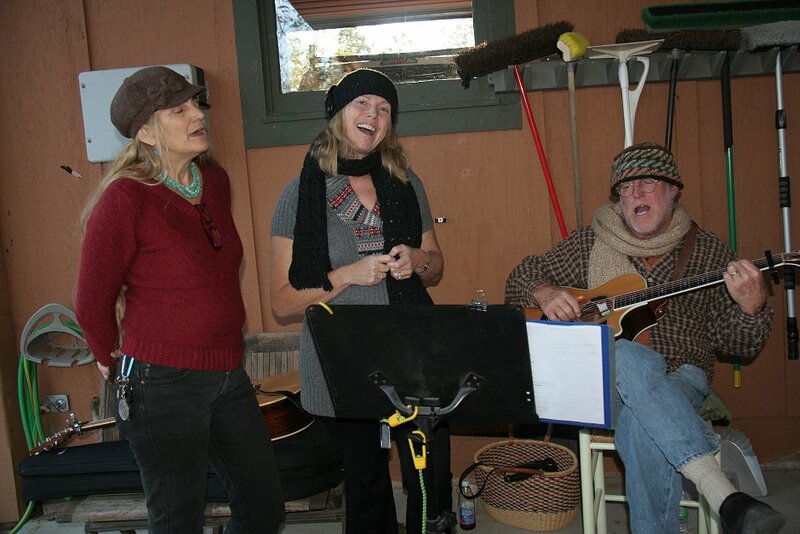 Entertainment was provided by this trio in an informal setting (note brooms in the background). Mary was very tired after a morning of shopping in Nevada City with daughter Julie, so we got to the open house late and left early. I did buy a wall hanging quilt from Michael Peerson and had a long chat with Gerald Davenport of http://ariapictures.com/, who produces DVDs much as I do but with a more Hollywood flare. I prefer mine because I also provide computer versions of my shows which project in high definition (1080p on a TV and up to 1800x1200 pixels on a computer screen). They also show in this high definition from a web page . See, for example, the video of the Penn Valley Rodeo Parade. I posted a series of video memories I made for Mary's 80th birthday, but at high not ultra-high definition in deference to those with moderate-speed Internet connections. All these videos play on Windows PCs but not on Macs.